Ah, blogging. One of the most important aspects of content marketing, and one of my very favorites. Whether you're running a blog to help build your business and connect with an audience or have yourself aimed in a more journalistic direction, I'm here for you. I have a ton of experience, from running a pet tips blog to churning out articles for a consumer awareness website. Here are a few examples of my most recent work, and as always, if you'd like more just get in touch! For executive coach Ben Jerome and his company The Jerome Group, I built a shiny new website and developed a blog to go with it. Check back twice a week for regularly-published articles about professional success and how to take yourself from a manager's office to the executive suite. I research all content, and ghostwrite everything to match the client's desired voice and tone. So What Kind of Listener Are You? Ever wish you could party like a pro? Bacon & Lox Society co-founders Heather and Alisa have essentially made a career out of creative celebration, which is why we developed the Bacon & Lox Blog to help tell their stories. You'll find everything from creative party ideas to scrumptious recipes on the B&L Blog — developed, ghostwritten, and designed from the ground up by yours truly. Bon appetite! 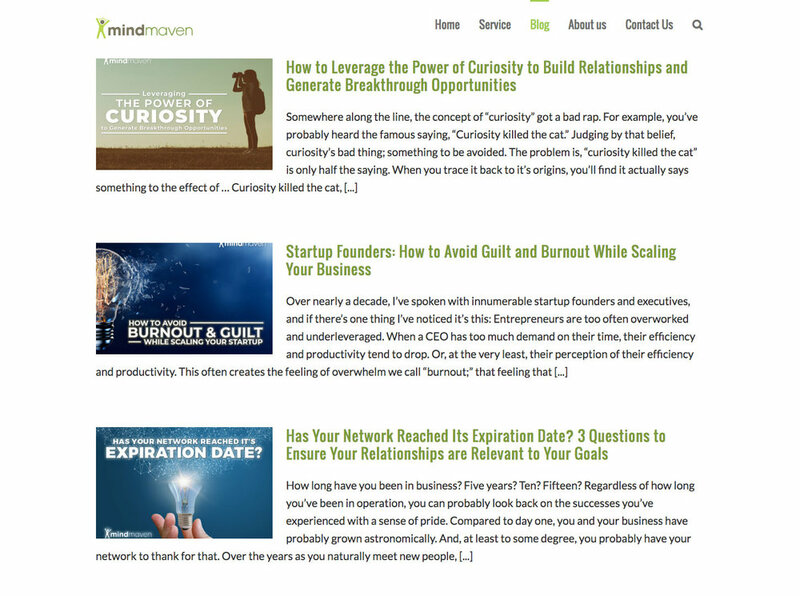 As part of the Mindmaven editorial team, I helped craft articles about how to network more effective in a super-fast-paced business environment. Not only did I learn a lot, but I got to contribute to some deeply-researched articles full of rich, actionable information. My personal blog Idiots_Delight is basically where I practice my chops as a culture critic. Since I'm pretty much constantly consuming some kind of pop culture (and aim to make it myself someday), I figured it would be a healthy exercise to write about it and put all that time spent in front of the screen to good use. It's also a place for me to work out ideas, try out some essays, and even post the occasional fiction from time to time. Enjoy! Hey, who doesn't want to be their best self? I've long been interested in the areas of self-improvement and personal development, and I've done some writing on a blog that I update from time to time called Modal Notes. This is where I share thoughts and ideas as to how we can make our lives more the way we want them. Enjoy! Ever wonder how to save cash and protect yourself from hackers, scammers, and sneak-thieves? Wonder no more! For a while I wrote content for the Scambook Consumer Awareness blog. Take a peek at a few choice samples, and feel free to have a look at my author page if you'd like to read more. Working with 7-time New York Times bestselling author Neil Strauss, I expanded the content offering on his blog (the cornerstone of any solid content marketing campaign) and focus his subject matter (aiming towards men's issues and self-improvement), resulting in a much more effective — and pleasant to read — blog offering. I believe these samples are now behind a paywall, so shhh!